I've been thinking for awhile about doing this, but I just had too much stuff in the Garage at the time. 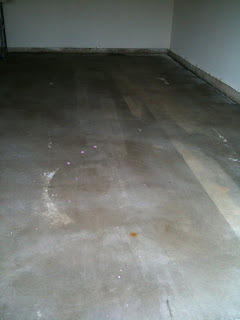 Well, after a huge cleanout over a couple weeks, I decided to go ahead and paint the Garage floor. It's not a huge pain as people make it out to be, it's just time consuming. The first thing you have to do is head to Lowe's. They makes kits for this kind of thing. What the kit consists of (at least mine did) is a bottle of "Acid" wash, a can of paint, a can of epoxy (hardener), and a can of fleck. The kit I got could be done in something like 40 colors. Of course there are the standard grey and browns, but i decided to opt for something a bit more colorful (and darker), a "Midnight Blue". First thing you have to do is sweep the floor, get all the misc dirt off of it, I swept it, then took my leaf blower to the floor to really get everything out of the garage. Then you mix the acid wash with water and clean the floor. 3 quarts water to 1 quart of acid wash, in a watering can. Get you a firm long handled scrub brush (which is also available at Lowe's or Home Depot), get the floor wet with the hose first, no puddling allowed, and then use the watering can to pour the mixture on the floor. I let mine sit for a second when I did the application just to let it soak for a second, then I scrubbed the floor really good in perpendicular directions. North and South, and East and West. (I didn't really scrub in the cardinal directions, but you get the point). The Instructions say to do a 10x10 area at a time, so that's what I did. Afterwards after scrubbing for about an hour, I rinsed it all out of the garage with the hose (if you are doing it right, you will see the dirt floating in the water you poured on the floor), and then squeegeed (also available at your nearest $home_goods_store) all the water out of the garage. After this stage is done, you have to let the floor dry completely, takes about 24 hours. Above is a picture of what the floor looked like after I washed it. You will still notice some misc paint stains and what not from various projects that took place in the garage, I did my best with a straight edge razor to get the majority of the paint spots up. I had a couple fans that I placed out in the garage to help the floor dry. So that helps. The next day, I mixed the hardener with the paint (in the paint can) stirred for three minutes, then let it sit (not in the sun) for 30 minutes. Poured some paint in a paint tray (I used disposable bio-degradeable cheap ones), grabbed a 3in brush and went around the edges of the garage by hand. If you have the cracks (or little ditches) in the floor of your garage, you should do those too (by hand), but I don't. After painting by hand, I got a roller (I used a cheap 3/8in nap roller on a 4 foot handle) and did the floor. The instructions say to do it in 2ftx6ft sections. I tried to keep to this, but failed. You also paint this in perpendicular directions to ensure even coverage. I found that painting in short strokes to ensure coverage, then going over the short strokes with really long strokes evened it out. After you paint the sections, take the fleck that comes in the can (if you are going to use the fleck, it hides the flaws in your paint and in the concrete on your floor (which after you paint it, you will see)) and go over the section you just painted. Just shake it out like you are putting seasoning on a steak on the grill or something. You'll get a feel for how much fleck you want on the floor when you start doing it. Start light. You can see I had to move everything from one side of the garage to the other (on the left of the picture), and you can also see I made a couple mistakes with the roller there at the bottom of the picture, but all in all, it turned out okay I think. Let it sit for 3 days (instructions say 72 hours), but I found that some places after that time frame will still be a bit sticky. Don't touch it or walk on it at all for at least 24 hours, (or you'll have shoe prints and what not, I was able to cover my one foot print as it was on the side). I let it sit for 3 days before I walked on it, walk around the floor with your hand and touch it, if it's a bit sticky, let it sit some more. If your feet stick to the floor, let it sit some more. Then I moved everything to the other side of the garage (cleaning the stuff out as I went) and I did the other side in much the same manner. A couple mistakes here and there but otherwise turned out pretty good I think, not terribly hard, just time consuming. Waiting for the floor to dry and such is the hard part. Just takes 3-4 days. At some point in here, they make a glossy kit for the floor, where it'll put a coat of clear on top and make the floor shiny. I didn't do this, but it's available. Thanks to a reader (Thanks Bob), who wrote in this morning asking if we have seen an increase in spam lately, I can personally confirm that yes, I have seen more spam in my inbox lately. Secondly another graph he sent in was an interesting correlation. It was how many viruses have been blocked by ClamD. As I said, I've noticed a big increase in spam lately in my own personal email as well. What about the rest of the readers? Have you guys experienced similiar? I received an email recently asking me why I haven't blogged (really at all) about email recently. This person enjoys my tips, and actually, the most read articles on my blog are about Email. However, I think it's because I have it figured out now. All listservers skip the inbox and go straight to their labels. All "bulk" email (twitter and facebook notifications, marketing emails, advertisements, special deals on Hertz rental cars, etc) is tagged as "Bulk" and skips the inbox. 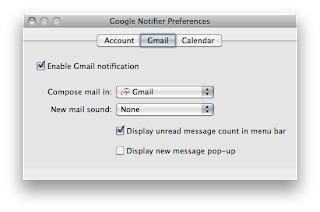 For the periodic "checking" of email I use Google's Notifier application. (http://toolbar.google.com/gmail-helper/notifier_mac.html) Where I have shut off the sounds, and shut off the popups. 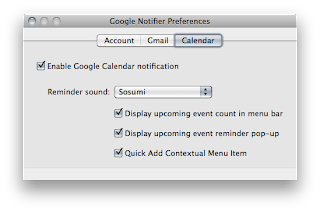 This also has the added benefit of working with my Google Calendar, where I DO have pop-ups enabled to remind me of stuff. I process email to Inbox Zero everytime. To flag emails I use the little stars. To make To-Do's I use Omnifocus. This has the added benefit of, you know, in case Gmail goes down (as it has recently a couple times), your "To-Dos" aren't managed by your Inbox. This has made my email process so efficient, I don't have to waste time screwing around with how to make it "Better". I thought about using tags to flag things as "To-Do" or "Important" or "Needs to be done" or something. But I don't want to mess with my system. It works.